This exciting text provides a mathematically rigorous yet accessible textbook that is primarily aimed at atmospheric science majors. Its accessibility is due to the texts emphasis on conceptual understanding. 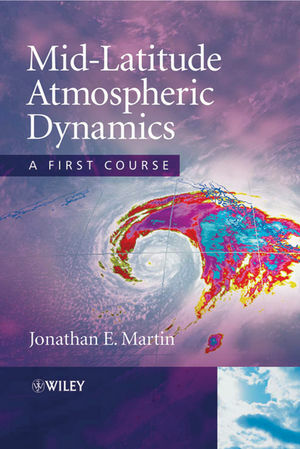 The first five chapters constitute a companion text to introductory courses covering the dynamics of the mid-latitude atmosphere. The final four chapters constitute a more advanced course, and provide insights into the diagnostic power of the quasi-geostrophic approximation of the equations outlined in the previous chapters, the meso-scale dynamics of thefrontal zone, the alternative PV perspective for cyclone interpretation, and the dynamics of the life-cycle of mid-latitude cyclones. A Solutions Manual is also available for this textbook on the Instructor Companion Site www.wileyeurope.com/college/martin. Jonathan E. Martin is a Professor in the Department of Atmospheric and Oceanic Sciences at the University of Wisconsin-Madison where he has taught since 1994. He has received numerous accolades for his teaching including the Underkofler Excellence in Teaching Award and is a Fellow in the Teaching Academy of the University of Wisconsin. His teaching excellence is allied with research expertise in the study of mid-latitude weather systems. Professor Martin has published extensively in scholarly journals and was awarded the distinction of being named a Mark H. Ingraham Distinguished Faculty Member by the College of Letters and Science at UW-Madison. 1 Introduction and Review of Mathematical Tools. 1.1 Fluids and the nature of fluid dynamics. 1.2 Review of useful mathematical tools. 1.2.1 Elements of vector calculus. 1.2.2 The Taylor series expansion. 1.2.3 Centred difference approximations to derivatives. 1.2.4 Temporal changes of a continuous variable. 1.3 Estimating with scale analysis. 1.4 Basic kinematics of fluids. 2 Fundamental and Apparent Forces. 2.1.1 The pressure gradient force. 3 Mass, Momentum, and Energy: The Fundamental Quantities of the Physical World. 3.1 Mass in the Atmosphere. 3.2 Conservation of momentum: The equations of motion. 3.2.1 The equations of motion in spherical coordinates. 3.3 Conservation of energy: The energy equation. 4 Applications of the Equations of Motion. 4.1 Pressure as a vertical coordinate. 4.2 Potential temperature as a vertical coordinate. 4.3 The thermal wind balance. 4.4 Natural coordinates and balanced flows. 4.5 The relationship between trajectories and streamlines. 5 Circulation, Vorticity, and Divergence. 5.1 The Circulation theorem and its physical interpretation. 5.2 Vorticity and potential vorticity. 5.3 The relationship between vorticity and divergence. 5.4 The quasi-geostrophic system of equations. 6 The Diagnosis of Mid-Latitude Synoptic-Scale Vertical Motions. 6.1 The nature of the ageostrophic wind: Isolating the acceleration vector. 6.1.1 Sutcliffe’s expression for net ageostrophic divergence in a column. 6.1.2 Another perspective on the ageostrophic wind. 6.2 The Sutcliffe development theorem. 6.3 The quasi-geostrophic omega equation. 6.4.1 The geostrophic pradox and its resolution. 6.4.2 A natural coordinate version of the _Q-vector. 6.4.3 The along- and across-isentrope components of _Q. 7 The Vertical Circulation at Fronts. 7.1 The structural and dynamical characteristics of mid-latitude fronts. 7.2 Frontogenesis and vertical motions. 7.5 Precipitation processes at fronts. 8 Dynamical Aspects of the Life Cycle of the Mid-Latitude Cyclone. 8.1 Introduction: The polar front theory of cyclones. 8.2 Basic structural and energetic characteristics of the cyclone. 8.3 The cyclogenesis stage: The QG tendency equation perspective. 8.4 The cyclogenesis stage: The QG omega equation perspective. 8.5 The cyclogenetic influence of diabatic processes: Explosive cyclogenesis. 8.6 The post-mature stage: Characteristic thermal structure. 8.7 The post-mature stage: The QG dynamics of the occluded quadrant. 9 Potential Vorticity and Applications to Mid-Latitude Weather Systems. 9.1 Potential vorticity and isentropic divergence. 9.2 Characteristics of a positive PV anomaly. 9.3 Cyclogenesis from the PV perspective. 9.4 The influence of diabatic heating on PV. 9.5 Additional applications of the PV perspective. 9.5.1 Piecewise PV inversion and some applications. 9.5.2 A PV perspective on occlusion. 9.5.3 A PV perspective on leeside cyclogenesis. 9.5.4 The effects of PV superposition and attenuation.